The 16th verse of the sura “The Ant” informed us of the language of birds. In the continuation of the same sura, it is understood that Solomon had also been taught the language of ants and in verse 18 the communication between ants is represented by an example. Research on ants has in fact demonstrated that the ants had a very complicated social organization that enabled them to communicate with each other. 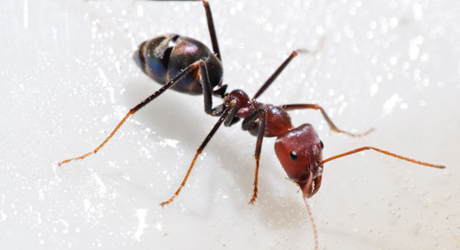 In their tiny heads, the ants have some 500,000 nerve cells. They are equipped with extremely sensitive antennae and bodies that secrete many chemical substances, of which they benefit in order to realize their communication. The pheromone secreted by their endocrine glands is one such substance. They use this secretion to communicate with one another. Ants perform certain things in a much more orderly fashion than human beings do; this secretion enables them to gather, share things, defend and feed themselves. Different species of ants have different endocrine glands. For instance, the alarm and attack commands are given by the dufour glands, while the sternal glands are used during exodus in colonies and in chasing their prey. Every ant uses these secretions as human beings use their language. In the verse, the ant in question is female. Just like in the case of bees and spiders, this use of feminine gender is significant. Colonies of ants show similarity with the hive of bees. The only function of male ants is to have sexual relations when they are mature. Male ants die soon after they copulate. All the work is performed by barren female ants in colonies. As in the case of the beehive, the colony is a world where the mother and sisters reign. Him have created. Indeed, the transgressors are far astray. 16- And Solomon was David’s heir. He said: “O my people! In the above verse, it is said that the Prophet Solomon was taught the speech of birds in addition to many grace by God. The Quran refers to the communication between birds and to the fact that the twittering and singing of birds has particular meanings. Birds, like human beings, do communicate. This undeniable communication is certainly not as developed as it is in man. Studies on crows have demonstrated that they emit a variety of sounds, namely, to call the colony of crows to come together, to express alarm, and to communicate a state of distress. Ornithologists, who have recorded these sounds using a sonograph, are still engaged in deciphering the meanings behind them. Bernd Heinrich, among these scientists who speak of the difficulty in decoding the sonograms, associates this research work with the work of the inhabitants of other planets visiting our earth and tries to decipher eating, playing, making love and activities like catching fish using a sonograph. What we are trying to do is to imagine ourselves in their place. Bernd Heinrich speaks of the difficulty encountered in deciphering the language of animals in general, as different species have different ways of communicating, each calling for a different approach. Research studies carried out by zoologists disproved the belief that the sounds the animals make are casual and that they do not engage in communication among themselves. In the Quran special consideration is given to the communication between birds and ants. This fact may lead the inquirers to study other animals. For instance, studies on elephants have demonstrated evidence of their communicating with one another from very long distances. Dolphins’ communication also has been among the points of interest among researchers. Because of their ability to communicate with one another through a range of distinct sounds, dolphins have become the object of serious scientific and experimental studies. Whistling, screeching and clicking enable them to establish communication. They send sound waves with a kind of sonar. This system enables them to recognize objects in dark waters and measure distances. Their sound frequencies range between 0.25kHz and 200kHz. The higher frequencies are used to spot locations and the lower ones are used for communication and orientation. To detect the communication signs of dolphins, experiments have been conducted by immersing microphones in the sea, and putting artificial obstacles in front of dolphins. After these experiments, scientists have concluded that dolphins talk to each other, although the meanings of the different sounds they emit have so far not been deciphered. (See the experiments conducted by Dr. Dreher, Dr. Evans and Dr. John C. Lilly). In all the specimens of creation the perfection and impeccability of God’s work have been manifest. Those eyes that can perceive and those hearts ready to receive can witness all these. that’s God work ad we need to believe in him.